Rehabilitation is an important step in the continuum of care provided for both children and adults. Saint Anne's rehabilitation services include physical, occupational and speech-language services for adults and children. Our expert rehabilitation services can help each patient maximize abilities, lessen pain, and learn to manage a wide range of conditions. 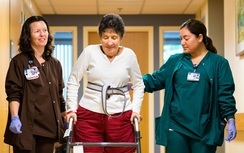 Saint Anne's individualized rehabilitation programs, using the latest treatment therapies, are tailored for patients who have had surgery, accidents, strokes, illnesses, or conditions that affect movement, daily function, cognition, swallowing, and/or language. Swallowing and feeding (often following a stroke). This may include VitalStim® therapy. Rehabilitation services for children, including physical therapy, occupational therapy, speech-language therapy, and specialized therapies, are provided by our pediatric specialists with the Fernandes Center for Children & Families. Services include evaluations, treatments, and school consultation as needed.